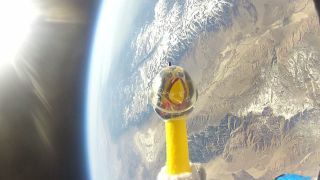 Camilla, the SDO mascot, flies on a balloon at approximately 124,800 feet on March 3, 2012. A NASA video chronicles the flight of a rubber chicken during a sun storm in March, a student experiment to observe the radiation from the strongest solar tempest in nearly a decade. Members of the Earth to Sky student group at Bishop Union High School in Bishop, Calif., sent the rubber chicken named Camilla to an altitude of 120,000 feet (about 36,500 meters) aboard a helium balloon, exposing the rubber fowl to high-energy solar protons from the unusually powerful sun storm. "We equipped Camilla with sensors to measure the radiation," Sam Johnson, a 16-year-old Bishop Union student, said in a statement. "At the apex of our flight, the payload was above 99 percent of Earth's atmosphere." The experiment was part of a bigger astrobiology project that the students are planning. Camilla was something of a celebrity even before the flight. As the mascot for NASA's Solar Dynamics Observatory, Camilla is the face of the mission's educational outreach program. The rubber chicken and its handler, Romeo Durscher of Stanford University, help keep the public up to date on NASA's heliophysics missions. "Camilla's trip to the stratosphere gave us a chance to talk to thousands of people about the radiation storm," Durscher said in a statement. For her high-flying trip, Camilla was outfitted with a pair of radiation badges — same as the ones used by medical technicians and nuclear workers to assess radiation dosages — on the exterior of her custom-knitted space suit. SPACE.com set a NASA video of the rubber chicken's balloon flight to the music of rock band Chickenfoot to chronicle the flight. The rubber chicken flew first on March 3, before the radiation storm occurred, and then again on March 10, as the storm was raging. The two flights gave the students two sets of observations to compare. On her first flight, Camilla spent roughly 90 minutes in the stratosphere, where temperatures and air pressures are similar to those on Mars, according to NASA scientists. "It was a beautiful liftoff," said 15-year-old Amelia Koske-Phillips, who was the team's payload manager. The entire flight lasted 2.5 hours, and Camilla parachuted safely back to Earth after the helium balloon popped, as expected, at an altitude of about 25 miles (40 kilometers). The payload, which included four cameras, a cryogenic thermometer and two GPS trackers as well as the rubber chicken, landed in the Inyo Mountains. The students also sent seven insects and two dozen sunflower seeds along for the ride to see how they would respond to the suborbital balloon trip. The balloon carrying Camilla Corona SDO, mascot of the NASA's Solar Dynamics Observatory (at lower right), bursts in the upper atmosphere during the flight on March 10, 2012. A week after the first flight, the students repeated the experiment when the solar storm was in full swing. Sunspot AR1429, the source of the raging storm, unleashed more than 50 solar flares in the first two weeks of March. From March 7 through March 10, as the solar storm reached its peak, charged particles bombarded Earth's upper atmosphere with enough heat to power every residence in New York City for two years, NASA scientists said. When Camilla launched into the solar storm March 10, satellites orbiting Earth reported solar proton counts that were roughly 30,000 times higher than normal. "The profile of the second flight was almost identical to the first — perfect for our experiment," Johnson said. "We recovered the payload from a landing site near Deep Springs, Calif."
The insects did not survive. The radiation badges that were attached to Camilla are being analyzed at a commercial laboratory. Meanwhile, students are now planting the radiation-exposed sunflower seeds to see whether their flowers differ from flowers produced by regular seeds on Earth. As for the insects, the students are pinning the corpses to a board, called "the Foamboard of Death," which includes a collection of bugs that have traveled to the edge of space.